Beginning in 1972, cars were equipped with air conditioning. It would be the final year for the white roof. Also, rather than painting the doors white, the Highway Patrol shield was printed on a sheet of white vinyl, which was applied to the doors to give the look of a painted door without the cost. This method remained in effect through 1991. The 440'S compression dropped again to 8.2:1. For 1973, the Plymouth Fury I Pursuit sedans of the Minnesota Highway Patrol were ordered with solid maroon paint; no white top. 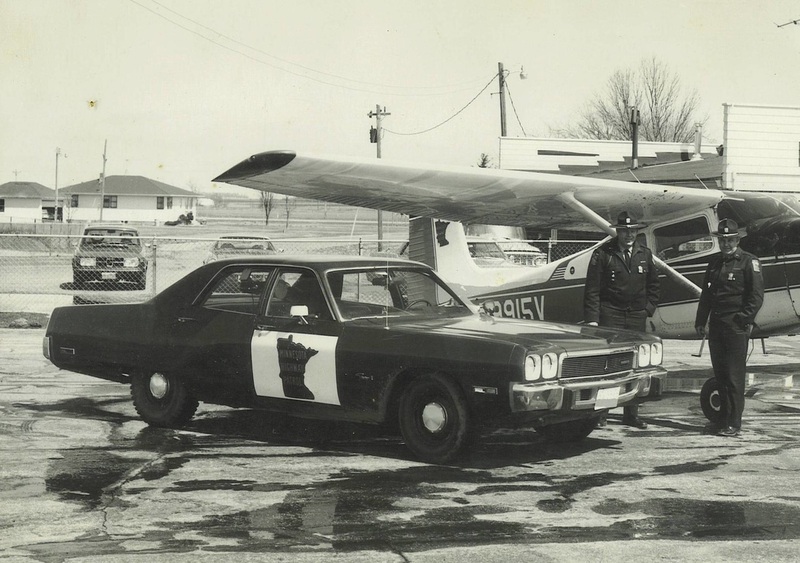 In the photo above, Cliff Mulder and Pilot Don Keepers are pictured with a 1973 Plymouth Class B sedan and one of the Highway Patrol's aircraft at the Pipestone, Minnesota, airport. The Minnesota Highway Patrol gained greater enforcement authority and a name change in 1974. The agency became the Minnesota State Patrol and Patrol Officers officially came to be called State Troopers. Along with the name changes came a change in vehicle graphics as the uniform shoulder patch design was adapted for use on the cars. 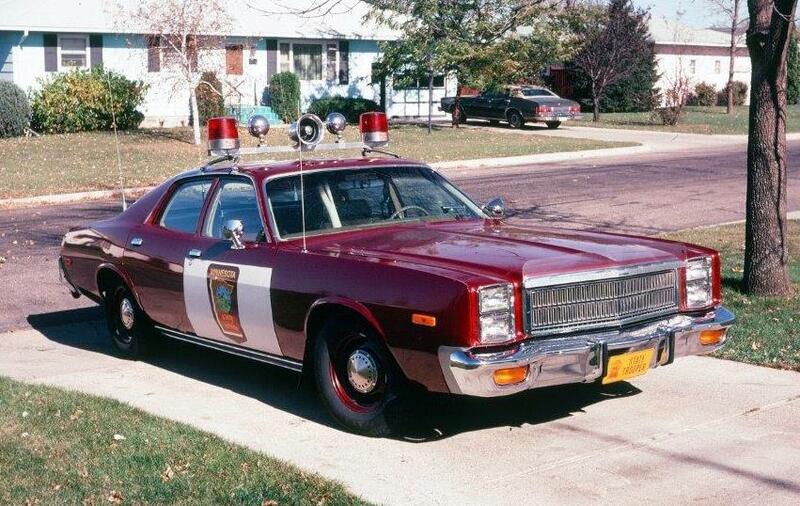 1974 saw Plymouth sell more police package vehicles than any other car maker. The 440 V-8 with 4-bbl carburetor produced 275 horsepower and was mated to an automatic transmission. This was the final year for the Fury I, II, III monikers from Plymouth. 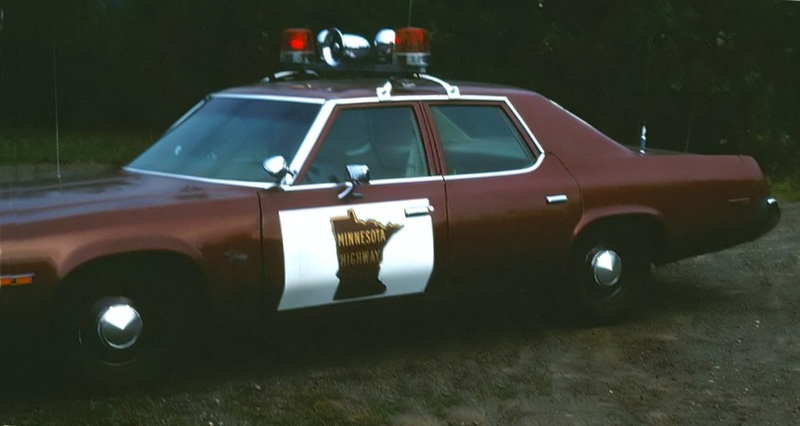 In 1974, the Minnesota State Patrol was attempting to conserve fuel where they could. 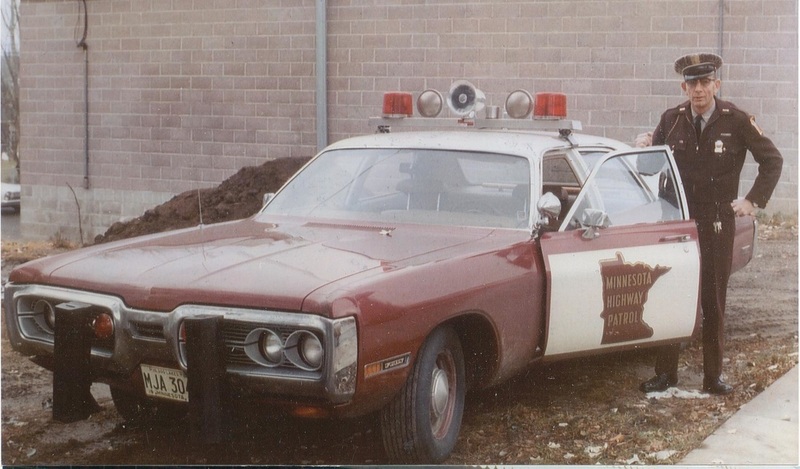 District Commanders were furnished with 1974 AMC Ambassadors as pictured here. When compared to the 440-equipped Plymouths of the day, the non-pursuit Ambassador ran a “fuel-efficient” 360 cubic inch V-8 with a 2-barrel carburetor and 3-speed automatic transmission. A number of photos on these pages were provided courtesy of the family of Adolph “Rosie” Rosetter who served on the Minnesota Highway Patrol from 1934 until his untimely death in 1969. Rosie was admired and respected by the citizens he served. In July 1974, a stretch of Chippewa County Highway 15 beginning in Montevideo was dedicated in his honor. Senator Hubert H. Humphrey spoke at the dedication and ribbon cutting of Adolph Rosetter Memorial Drive. The Rosetter family was driven to the event by Captain Norris Sletten in his F-9 Copper Poly Ambassador. Renamed Gran Fury, the 1975 Plymouth was easily distinguished from its 1974 counterpart by the bold chrome bar in the grille and the chrome moulding on its sides. The proven 440 V-8 continued in use, although horsepower dropped again to 250. In the middle and late 1970s, the national 55 mph speed limit was saving fuel and saving lives. In an effort to discourage would-be scofflaws from violating the speed limit, Governor Rudy Perpich wanted the State Patrol to make their presence known and mandated all State Patrol cars be fully marked. As a result, all previously unmarked cars were either retrofitted with lights and graphics, tucked away for future use, or traded in. The Gran Fury was treated to little more than a facelift for 1976. The grille was a little bit larger than the previous year’s and quad headlamps gave way to a two lamp system. The cars were equipped this year with power windows, a very welcome accessory. The State Patrol also field tested the slightly smaller, 400 V-8 powered Fury in their fleet this year. Virtually unchanged since 1974, the 440 V-8 equipped Plymouth Gran Fury remained the choice of the Minnesota State Patrol in 1977. The Gran Fury name would take a two-year hiatus after the 1977 model year. With the full-size Gran Fury no longer in production, the somewhat smaller Fury became the car of choice for patrol duty. This was the last production year for the venerable 440. 1979 marked the State Patrol’s 50th Anniversary. 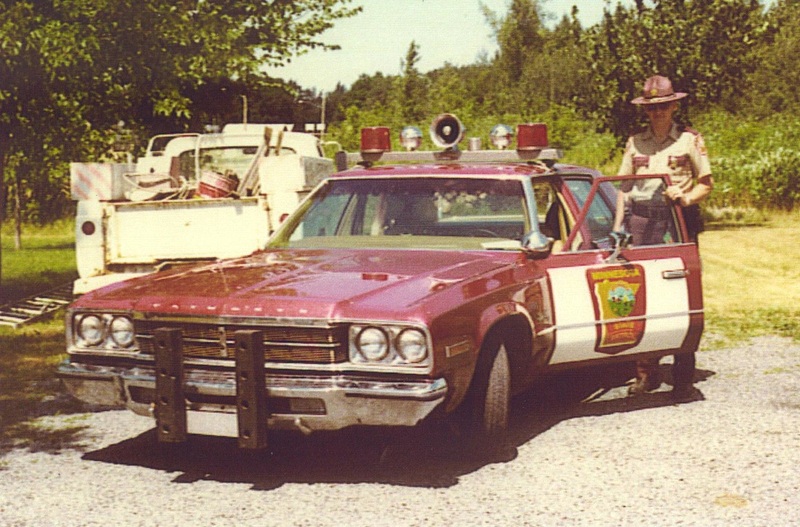 This Dodge St. Regis is an original State Patrol unit equipped just as it was in 1979. Chrysler Corporation downsized their full-sized cars for 1979, offering the nearly identical Chrysler Newport and Dodge St. Regis. There was no full-size Plymouth available this year. The reliable 440 powerhouse was no longer available and the highest performance engine offered was the 360 CID 4-bbl V-8. Coupled to a 3-speed automatic and a 2.9:1 rear axle, they were pretty good performing units for the day. They were bordering on luxurious with cushy seats trimmed in gold brocade fabric. 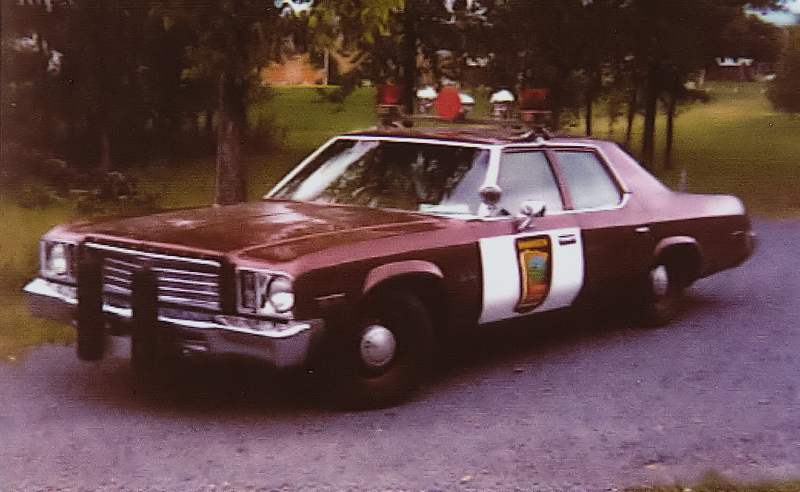 The State Patrol purchased about 20 used 1979 model cars in 1981. These “Super Spooks” were primarily 2-door sport coupes or other vehicles not generally associated with police work. There were Chrysler Cordobas, Ford Thunderbirds, Mercury Cougars, Dodge Diplomats and even a Chevrolet Camaro or two. Some of these units were good honest used cars and others were of questionable origin. Some were used cars and some were just plain used up. They served their purpose apprehending speeders who might otherwise have recognized a squad car. The purchase of used cars for patrol use has not been repeated. The Plymouth Gran Fury reappeared in 1980 and was selected for the Minnesota State Patrol fleet. Just a few dollars lower priced than the Dodge St. Regis, the two cars were nearly identical. For 1980, MSP purchased half the cars with a 318 CID V-8 with California Emissions Package and half with the more powerful 360 CID V-8, all for a bid price of $7,047 each. A single large tailpipe was an indicator a unit was equipped with the pathetically underpowered California Emissions 318. The 360-equipped units benefitted from dual exhaust. 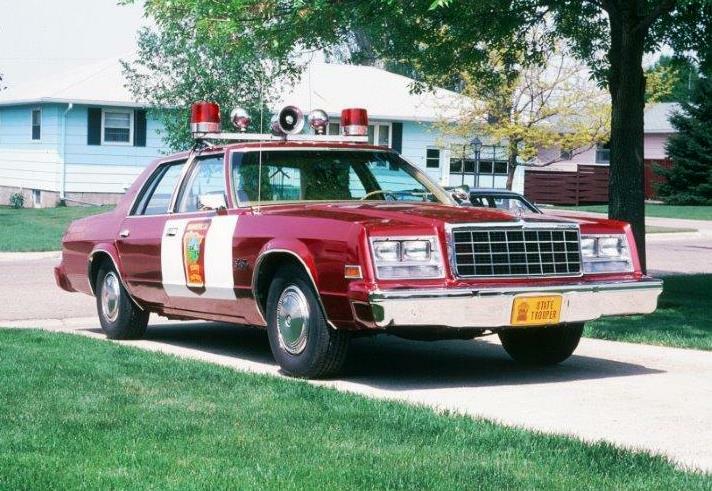 In response to rising fuel costs, the Minnesota State Patrol purchased a variety of specialty vehicles in 1980. Central Office staff were issued Chevrolet Citations and several District Captains drove the AMC Concord. The Concord was equipped with a 258 CID inline six and a 3-speed automatic with lock-up torque converter. They were not intended for patrol use, but anyone who put one to the test can tell you they’d handily outperform the California-emissions equipped Plymouth Gran Fury of the same year. The example pictured here surprised many violators when it roamed the highways in southwestern Minnesota.